Does audit mode still exist? Hi! I've known Coursera since 2014 more or less, and I understand that changes were made obver the years. There used to exist the option to Audit for free, but I can't find it now. I press "Enroll" and I all I see is the 7-day-trial dialog window. It prompts me to put a credit card's info on it, but I'm not interested in that. Not even a 7-day-trial. I only want to Audit the course. Anyone can help me? 1- Click the title of the course on the home page of this Specialization. 2- You will be taken to the course home page. For example, this is the first course. 3- Now, click the Enroll button. You will see such an option. Thanks for sharing this with us, @Maryam ! It concerned me to read, “go as fast as you can, the faster you go, the more you save”. To me, the faster youngo, the less you will be able to absorb and learn. @ARomina, you can audit the first course to see how it goes. After getting the feel of this Specialization's topic, if you really want to explore the other courses as well, then you may want to consider applying for financial aid. 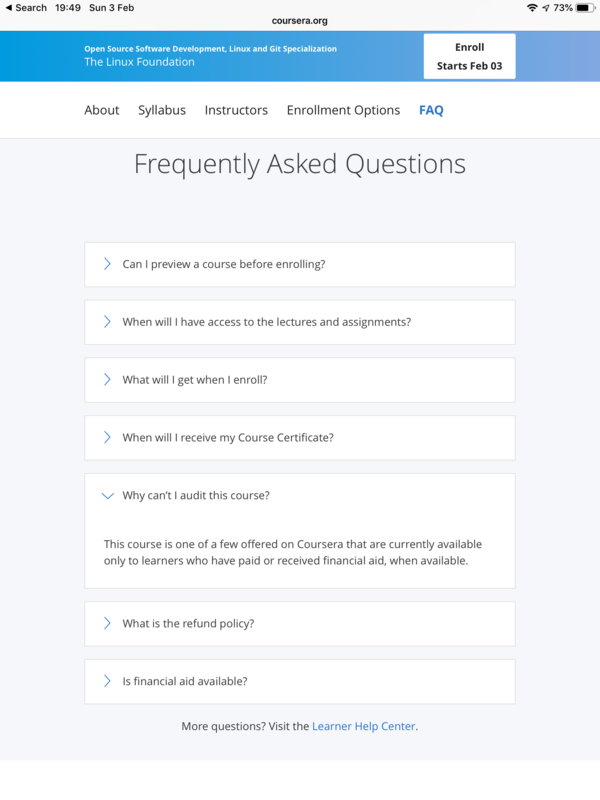 As you can view on Scotty's screenshot, the other ones may not offer that option but they allow learners to apply for financial aid. 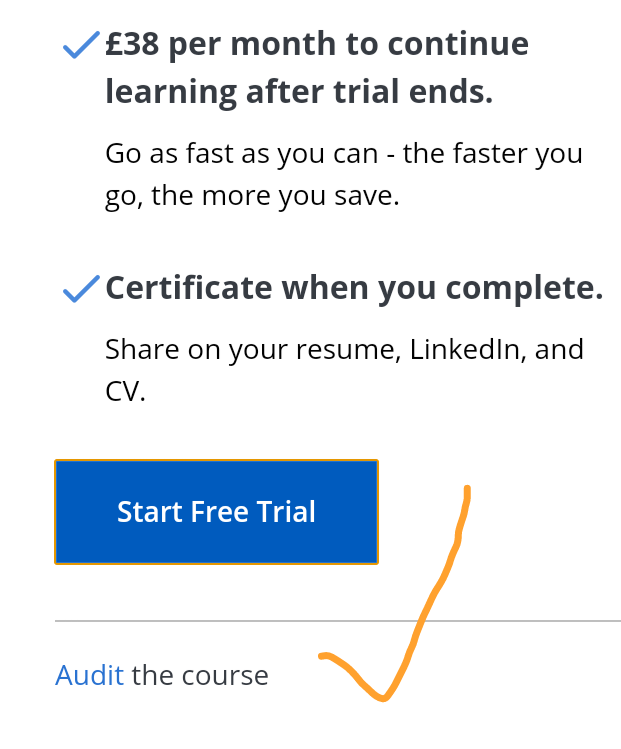 It is a great option which enables learners to see the course content fully and even get a Course Certificate (https://learner.coursera.help/hc/en-us/articles/209819033). @Judith, yes, I see your point. However, the "more you save" portion encourages learners to complete the course as fast as lightning. @Maryam , this is an interesting dilemma. By saying this, you rush people through the courses, but you also get more people who actually complete them. If they were serious about it, they could go over the materials again after the course. It must take much away from discussions thiugh, if people are in such a rush to complete it. What do others here think? Is this a good thing?